One of the most viewed and discussed posts I’ve ever written is a personal story about dealing with some pretty horrible street preaching I witnessed at Fresno State. If you haven’t read it yet, I’d encourage you to check it out. It’s the story of one of the most emotional days I’ve had in years, of continuing to attempt communication with the preachers and repeatedly failing, and finally how God used my friend Gabi to demonstrate the love of Christ to a throng of angry atheists. I was catching up on one of my favorite podcasts the other day, Greg Koukl’s show Stand to Reason. This is one of the few podcasts I never miss an episode of and it’s had a major influence on my life. So I’m listening to the show and the first caller asks for Greg’s take on street preachers, particularly the kind who don’t seem to show God’s love very well. You can listen to this episode by clicking here, downloading either of the MP3 options and then skipping to 21:19. I’m going to summarize Greg’s two main points here though, in case you can’t listen to it yourself. I’ll also add a point from a recent blog post from STR’s newest staff member, J Warnor Wallace. This post isn’t just relevant to street preaching. I think these tips are relevant to any pro-life advocate who wants to communicate to an apathetic world about one of the worst injustices we know about. I’ve seen a lot of pro-life communication, both in person as well as online, that feels similar to the kind of angry street preaching I’m talking about. I suspect that this guy isn’t doing it very well. Public proclamations used to be the way communication was done. For that reason, it didn’t seem odd or out of place. That’s not true anymore. Communication looks very different now than it did just 100 years ago. This is part of the reason that street preaching looks so weird to people. That doesn’t always make it ineffective. There are a few guys that do it really well. I think Ray Comfort is very effective and Greg has also mentioned Andrew Rappaport several times on his show as being a good street preacher. 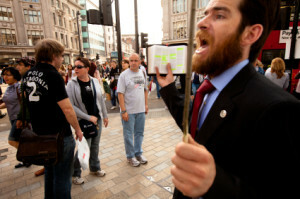 But generally speaking, for most people, street preaching is no longer as effective as other means of communication. And if you’re not going to do it well, it’s better to not do it at all. Don’t add harm, when you could help in other ways. Update: 3/25/13: This article has gone viral. Thanks to Abby Johnson, Live Action News and LifeSiteNews for running it. The article has been shared all over Facebook with thousands of views, likes and comments. I hear it’s been discussed all over Fresno State University, even among non-Christians. Thanks so much to everybody that shared it. Update: 7/2/13: I just published a follow-up post with three excellent points on the topic of angry street preaching from Stand to Reason. Today was a weird day. While at Fresno State University, I witnessed the worst street preaching I’ve ever seen. I also witnessed what God can do with a few humble servants that want to show love while preaching truth to a crowd of disgusted atheists, Mormons, Muslims, and at least one Catholic guy. While telling the story, I’m going to write some things that have been going on in my heart lately as I think about communicating effectively to people who are different from us. I was at Fresno State with my colleagues Gabi Vehrs, Kyle Goddard and Clinton Wilcox with hopes of engaging the students on the issue of abortion. We haven’t had a lot of success with Fresno State’s busy students in the past, so we set up a small JFA exhibit that we hadn’t used before at FSU as an R&D test, and just invited a few seasoned pro-life advocates to join us and test the outreach tool and its effect on FSU students. A few decent dialogues later we heard some loud noises coming from the Free Speech Area. We looked over, and I saw three street preachers yelling at the students, some of whom stopped to listen. Before I describe what they were saying, I should say something. I don’t think all street preaching is bad. I think people like Ray Comfort can be very effective, but he’s a seasoned evangelist who has gained some very helpful skills and a lot of experience. I generally prefer relational evangelism, because most people are going to take the words of a friend much more seriously than the words of a stranger. That being said, a thoughtful street evangelist can get some people thinking about religious ideas, and obviously that’s a good thing.